As in one of my projects I needed to run a Tomcat server for later deployment of the webapp, I decided to use an embedded variant of the tomcat server in maven. Important here is to add the extra configuration with mode set to both, i.e. allowing to deploy a given context.xml. Lets now configure our web.xml in order to detect .shtml files and process the SSI inside of them. As you can see we used the SSI Servlet instead of the SSI Filter, which also could be used. Just look into the documentation of tomcat server. Important: We need to set the mime type differently than the official documentation says. Otherwise FireFox (tested in 4/5) won't detect the document and instead trys to download it. When using JPA as your ORM in Java Web applications, you likely use transactions. As transaction-type you specify "RESOURCE_LOCAL" in your persistence.xml. "joinTransaction has been called on a resource-local EntityManager"
That means, somehow a joined Transaction should be used, although we didn't configure JTA. The source of this problem is, that we would call multiple times new transactions, which won't be executed after each other, but in parallel. The solution was to set all methods in which a transaction is used to synchronized. This leads to exact processing of the transactions in correct order. These series should give you insight into the architecture and implementation of my video chat. This time I will dive into the Local testing mode of the application. This image shows you the GUI of the local menu. 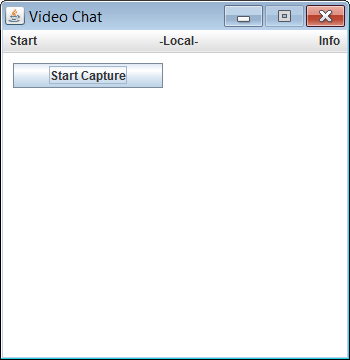 When clicking on "Start capture" a local video of your webcam should show up. If not you might be asked to query first for existing devices. 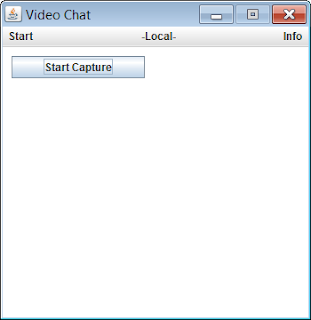 In my opinion, this is a bug in the driver dll, because when clicking another time on "Start capture" the webcam will get connected properly and everything works as usual. What is now the magic behind that GUI? When clicking on "Start capture" a method called "startCapture" will be called. How does it work? Basically we create an JInternalFrame for displaying the video later. The important steps are done between the try and catch block. At first we state that we want the VFW - video for windows driver and create a new MediaLocator. From this medialcoator we can create a new DataSource. The last step is to connect to the webcam and capture live images and add these to the JInternalFrame. Let's have a look at the CaptureVideo class that will take care of the rest. // Do we have at least one track? What does now happen in this method? As the result will be a JPanel which can be easily attached to GUI components we have to create one. The next step is to create a Processor to have control over the datasource. When the processor is realized, we can create a Player that contains the visualcomponent which can be added to the Panel. Note: It is important to follow a certain order when starting the processor and the player, otherwise you won't get it to work together. That's basically everything to get a webcam working.